We're approaching our build a bit different than most, at least different than the manual suggests. Rather than immediately removing the body and starting in on fitting sheet metal and mechanical work, instead we decided to properly locate and mount the body while it was in place from shipping. 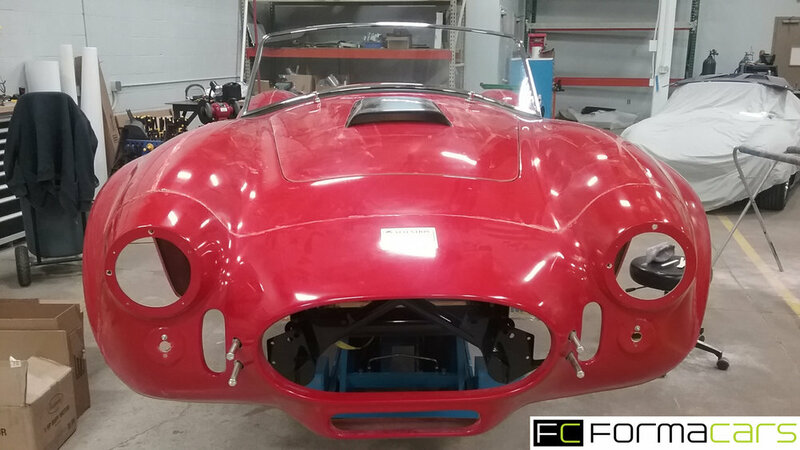 We located the mount holes front and rear, added shim to the sheetmetal for the bulb seal, located and screwed down the rockers and then were able to properly fit up the windshield, the doors, hood and trunk lid. We also are planning to flush mount the hood scoop rather than riveting it on. So we cut an opening in the hood that allowed us to push the hood scoop up from the bottom. Our body man will then mold the scoop to the hood for a nice flush appearance. Once everything was properly located, off the entire chassis went to the body shop to have the doors, hood and trunk fit to the body. In our case, there was a lot of filler work in the body at the back of both doors to get the contours right. I wish I got more images at the body shop, but I didn't. Once those were fit, we returned to the body shop with the body buck so we could remove the body from the chassis, place it on the buck and bring the chassis back to our shop. Our body man then kept going, getting ready for paint while we got to work on the chassis. We'll temporarily reunite them before final paint in order to do final trim on the header openings and work on the interior. Doing it this way should give us very good fit of the hood, doors and trunk, allows the body work to be done in parallel with the mechanical, should result in less handling of the body and we won't be doing that messy body work on top of a nearly complete chassis.